In this chapter, Hezekiah gets sick. He’s on death’s door, but he prays for recovery, and very quickly God promises to make him well. There’s a lot we could talk about here, from how God appears to change his mind after saying, “[Y]ou shall die and not live” (38:1), or how Hezekiah makes his appeal for healing on the basis of his goodness before God: “I have walked before You in truth and with a whole heart” (38:3). Or we could discuss the miracle God gives as a sign of Hezekiah’s coming recovery and the kingdom’s liberation from the Assyrian threat: “I will cause the shadow on the stairway, which has gone down with the sun on the stairway of Ahaz, to go back ten steps” (38:8). The text implies that the sun itself actually goes back to shift the shadow on the stairs. How does that even work? But that’s not what I’m going to focus on. No, I want to look at Hezekiah’s poem. The latter half of the chapter consists of a “writing” by Hezekiah. It’s in the traditional Hebrew poetic style, was likely set to music, and, to employ Walter Brueggemann’s terminology, it looks back on a period of disorientation from a place of new orientation, much like Psalm 30. Hezekiah recalls his illness, when he had no hope of recovery, saying, “I am to be deprived of the rest of my years…I will not see the Lord, The Lord in the land of the living” (38:10-11). He uses weaving imagery to picture his life as a cut thread or rolled-up garment (38:12), with the one God filling the role of the three Greek Fates in severing the king from the loom. Two lines from Hezekiah’s song particularly caught my attention. First, he says, “It is You who has kept my soul from the pit of nothingness, for You have cast all my sins behind Your back” (38:17). Hezekiah might have asked God to remember his goodness, but he’s also mindful of his own sin; he knows he doesn’t measure up to perfection, and it’s God’s mercy that keeps him from death. He goes on: “Those who go down to the pit cannot hope for Your faithfulness. It is the living who give thanks to You, as I do today” (38:18-19). Hezekiah recognizes the gift of life that God has given him, and he appreciates it more for having seen the brink of death. He’s seen that we have limited time on this earth to thank God for his faithfulness–so he writes a song. In third grade I got the chicken pox. Right around day four, the itching became nigh-intolerable. I remember laying on the floor in pain that afternoon, just outside the upstairs bathroom. I was nowhere near the edge of death, my chicken pox was hardly as severe as Hezekiah’s life-threatening illness, yet I recall wanting to die so that the itching would stop. Did I actually pray for God to end my life? I don’t remember. 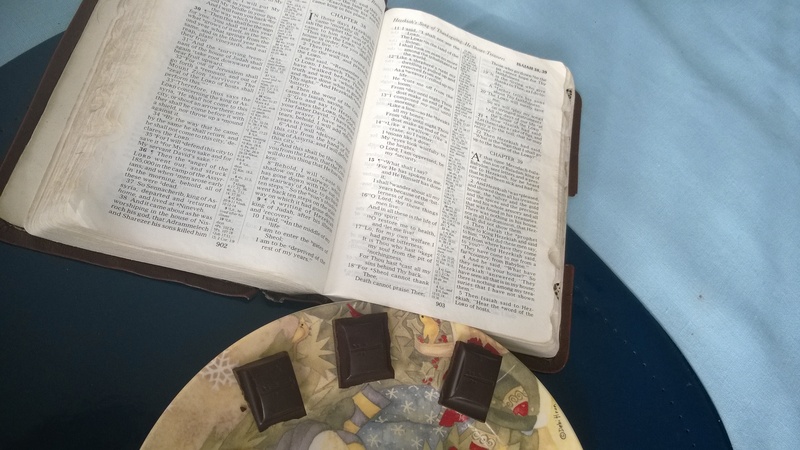 But I’m glad he didn’t grant my wishes, because if he had, I wouldn’t be here today, eating chocolate and reading Hezekiah’s song and writing a blog post about it. Posted in Daily Reading, Isaiah, Old Testament, Psalms.Tagged bible, christianity, death, forgiveness, God, Isaiah, metaphor, scripture, thankfulness, worship.